The Wishmaker House Bed and Breakfast, Winery and Wine Bar in downtown Bellville has been a hospitality hotspot since opening its doors in 2013; in two years of business the Wishmaker House has racked up recognition from villagers and visitors alike, and has even been inducted into the Richland County Tourism Hall of Fame. The Bellville bed and breakfast launched its business the weekend of the first NASCAR race at the Mid-Ohio Sports Car Course stated Swisher. The increased visitors to Bellville brought by the race proved to be a good time to begin their venture and the owners have not looked back. After a successful year of providing guests with a quaint lodging experience, the Wishmaker team decided to tackle another portion of the travel industry, expanding into a full-service winery and wine bar in the spring of 2014. Their wines don unconventional names like Harvest Moon and Midnight Rendezvous scenes conjured by the wine’s taste. In addition to wine and lodging, the Wishmaker House provides guests with a full-scale seasonally rotating menu that currently features summer options such as the lobster roll or the Miss Piggy flatbread. The menu changes every three months and typically feautres a weekly special. The Wishmaker House also frequently hosts musical guests on their outdoor patio section as part of their ongoing summer concert series. Britt Reed is slated perform next, on Aug. 1 beginning at 6:30 p.m.
Their hours are Thursday, Friday and Saturday from 4 p.m. to 10 p.m. For information on live music, events and weekly specials patrons can check their website at www.wishmakerhouse.com or visit the Wishmaker House at 116 Main Street in downtown Bellville. 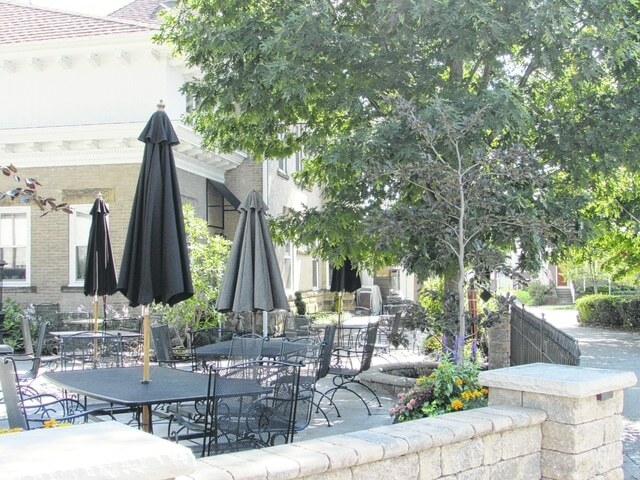 The back patio of the Wishmaker House, home to live music and entertainment. http://aimmedianetwork.com/wp-content/uploads/sites/39/2015/07/web1_IMG_4370.jpgThe back patio of the Wishmaker House, home to live music and entertainment. This entry was tagged Bellville, Ohio, Summer, Wishmaker. Bookmark the permalink.